To understand how property ownership strengthens people’s ability to enjoy full citizenship – and here we are talking about civic identity and the ability to enjoy economic and civil rights as opposed to legal citizenship – you don’t have to go back to the ancient Greeks and Romans who based the right to vote on landownership (and gender and age). Indeed, the link between property ownership and civic rights is clear in any reading of U.S. or European history. Even today, in dozens of countries in Asia, the Middle East, and sub-Saharan Africa, women do not have equal rights to own and inherit land. Women are often considered mere “guardians,” holding land in trust for their sons. It is no coincidence that in these same countries, women are often viewed as minors by the legal system – they can’t make a contract, open a bank account, or take out a loan. In my two decades of work in the land rights sector, I’ve seen how land rights bolster women’s, families’, and communities’ status, legal standing, and sense of membership in society. These non-economic benefits of land rights are harder to quantify than the economic benefits, such as improvements in health and nutrition, education, and poverty reduction, which have been documented in various studies around the world. However, they are critically important for our efforts to empower families, communities, and especially women in the quest to reduce poverty. Legal rights to land make women more visible, give them a bolder voice, and bolster their confidence. 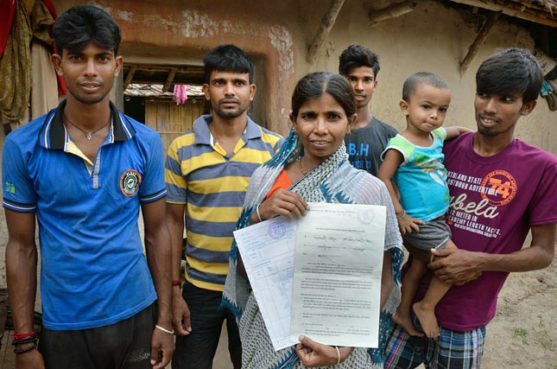 Women who have just been granted legal rights to land in India often tell us that they now feel empowered to speak up at home and at village meetings, and they can access government services like nutrition programs, work programs, and other initiatives meant to help the poor. In fact, they often didn’t need to be landowners to access these programs; they assumed they did and simply did not apply until they felt a sense of entitlement as landowners. To say that someone has “a sense of entitlement” has a negative connotation in the Western world. But in parts of Africa and Asia giving women, especially rural women, a sense of entitlement is critical. Entitlement signals that they know they belong, they are worthy of government support, and others agree. Improving land rights is a powerful lever for making this happen. When Shushmita Pallam gained rights to a plot of land through a government program in Andhra Pradesh, India, she told my colleague, “My land has earned me and my family a life of dignity and opportunity.” As a landowner, she now feels entitled and is seen as entitled. She is on equal footing with her fellow citizens. Likewise, a young Maasai man in Kenya named James once told a colleague that before he recognized women’s equal rights to own and inherit land, “I thought of my sister as a stranger living temporarily in my home.” Women in much of Africa and Asia move to their husband’s village when they get married and because of this often have the status of “outsider,” both in their birth home and their marital home. Outsiders, naturally, have weaker claims to the tribe, community, or family’s most important assets: land. Strengthening women’s rights to land changes this. When women have rights to the most valuable asset in a community or household, they are seen as belonging and entitled. An increasing number of countries have recognized that land rights are a gateway right, a key lever for economically empowering women and communities at a fundamental level. Countries from Rwanda to India are working to ensure women’s land rights are protected in law and in practice. Justine Uvuza is a senior gender and land tenure specialist at Landesa. This blog originally appeared on New Security Beat.